If you’re searching for basketball court resurfacing or construction for your property, it is vital to know what surfaces are most advantageous for your needs and allow for smooth, lasting surfaces that make playing one of the world’s most popular sports an absolute pleasure. Whether you want a half-court to enjoy at home or a full court on your property, it is vital to know what surface is right for you. The critical factors that affect how enjoyable a basketball court can be to play on are traction, durability, and shock absorption. Two of the most common materials that you may find in use today for these purposes are asphalt and concrete. Asphalt is easily the most common surface for outdoor basketball courts. While it does break down and develop small cracks and chipping over time, various rock blends can smooth the surface with relative ease. Weather sealant should always be applied before painting your court to ensure that it can withstand the elements that much longer. Concrete, another common surface material used in basketball court construction, is prized for its smoothness, endurance, and consistency. However, because the surface can be very unforgiving in its hardness, a rubber layer between the foundation and acrylic surfacing is applied to allow for shock absorption and more “bounce” when you play. On top of the acrylic layer, a polyurethane finish can be applied to add to the durability of the concrete as well as create a barrier to protect it from moisture. Concrete surfaces for basketball courts are generally installed with a vapor barrier as well as a sealant. Whether you need basketball court construction or resurfacing, the professionals at Taylor Tennis Courts have the tools, materials, and techniques to meet your needs. 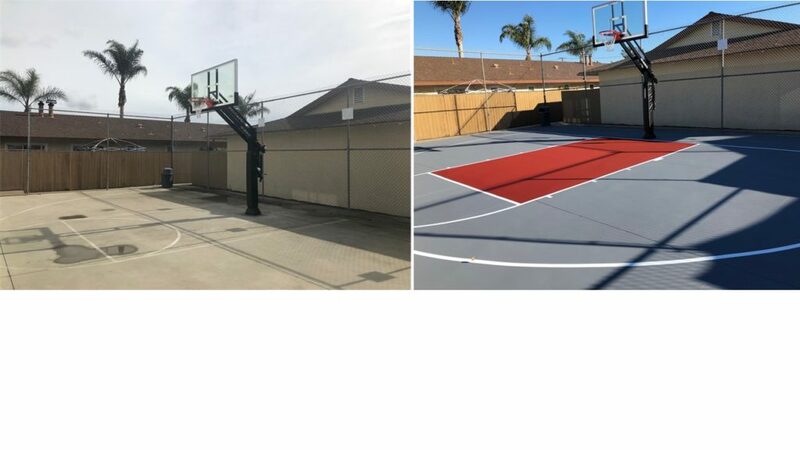 Our team has handled the construction and renovation of basketball courts all over Southern California, and we can help you with yours, too. Call us today at 800-558-3664 to find out more about our basketball court resurfacing and construction services.